PDK TRANSMISSION, PANORAMIC ROOF, PRIVACY GLASS, HEATED SEATS, FLOOR MATS, TELEPHONE MODULE, PORSCHE CARBON CERAMIC BRAKES (PCCB), PARK ASSIST FRONT AND REAR, DYNAMIC ENGINE MOUNTS, PORSCHE DYNAMIC CHASSIS CONTROL (PDCC), SPORT CHRONO, 20” TURBO S CENTRE LOCKING WHEELS, ADAPTIVE SPORT SEATS WITH MEMORY FUNCTION AND 18 WAY ADJUSTMENT, PORSCHE CREST ON STORAGE COMPARTMENT, PRIVACY GLASS, PORSCHE VEHICLE TRACKING SYSTEM (VTS). 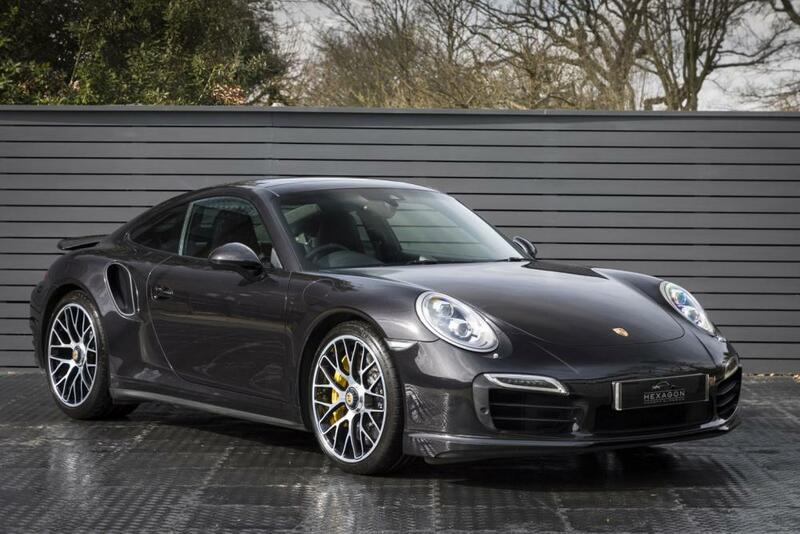 Hexagon Classics are pleased to offer a 991 Turbo S in the most desirable of colour combinations. Porsche 991 is the internal designation for the seventh generation Porsche 911, which was unveiled at the 2011 Frankfurt Motor Show on 15 September as the replacement for the 997, it was an entirely new platform, only the third since the original 911 launched in 1963 and was designed by Porsche’s Chief Designer Michael Mauer. The S version of the Turbo was added to the range in 2013 and boasted 552 bhp and 516 lb?ft of torque, but the torque was pushed to 553 lb?ft with over boost. The Turbo S is all wheel drive which helps the car reach 62 mph from a standstill in a modest 3.1 seconds as claimed by Porsche although this has been achieved 2.6 seconds by many well regarded car magazine in their independent tests. The 991 Turbo S features adaptive aerodynamics and rear wheel steering which helps the car lap the Nürburgring Nordschleife in 7:27, which is 3 seconds faster than the 991.1 GT3. The unique features of the Turbo S are the GT3-style mirrors, different front spoiler grilles and interior features. The power kit adds 29 KW of power and the following equipment, optional for the Turbo, are standard for the Turbo S: PDCC Porsche Dynamic Chassis Control hydraulic roll bar system, Sport Chrono (Launch control and 0.15 bar over boost functions), dynamic engine mounts, Porsche Ceramic Composite Brakes, central locking wheels, full LED dynamic headlights, adaptive Sport Plus seats (18-way adjustment, memory) and seat backrest shells upholstered with leather. Our stunning example was supplied by Porsche Centre Wilmslow in November 2013, has benefitted from two services.